All businesses must be competitive in their marketplace but when it's a family-run company the stakes are even higher. As a consequence, family businesses need to go that extra mile to ensure a personal and professional service. Sheffield based Gooding Group is one such business and after recognising they needed to update their forklift truck they got in touch with Ability Handling to discuss the options. Gooding Group was established in 1990 as a supplier of wardrobes, fireplaces and other household furniture to the construction industry. Many leading house builders have sourced these items from Gooding Group, including Taylor-Wimpey and Persimmon. As the company's reputation has grown, larger volumes meant that a new, larger capacity, forklift truck was required. 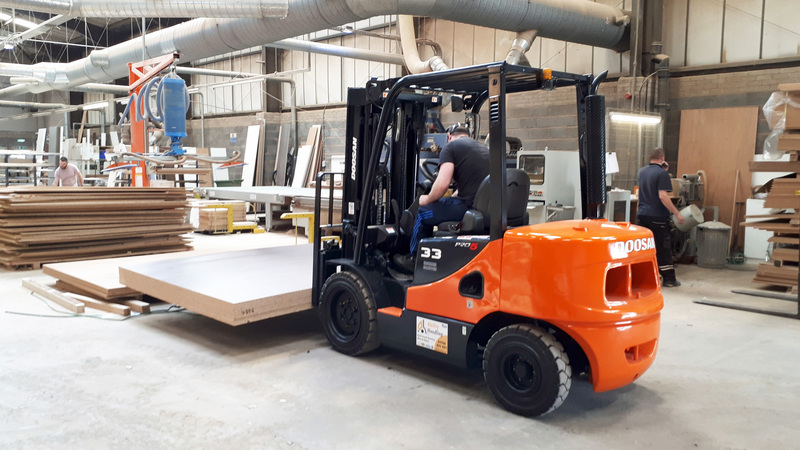 After considering the load requirements and budget, our sales team proposed a refurbished Doosan D33S-5, which had just had a complete overhaul following five years of reliable service with another customer. As well as a detailed inspection and any necessary repairs/­replacements, our refurbishment process includes a full service, repaint and 12-month CFTS thorough inspection certificate for complete peace of mind. Mark Hamilton of Gooding Group visited our premises, along with two of his operators who would actually be using the new forklift truck, to try the machine out. The demonstration was a complete success and Mark quickly placed his order to secure the truck for a fast delivery. If your business is growing and you're ready to expand your fleet, contact Ability Handling today!